William Mulholland's great St. Francis Dam broke at three minutes before midnight on March 12, 1928, sending a 180-foot-high wall of water crashing down San Francisquito Canyon and claiming approximately 470 lives by the time the floodwaters reached the Pacific Ocean at Ventura. The piano keyboard in the foreground of this photograph is an eerie reminder of the families that were caught unawares in the middle of that fateful night. 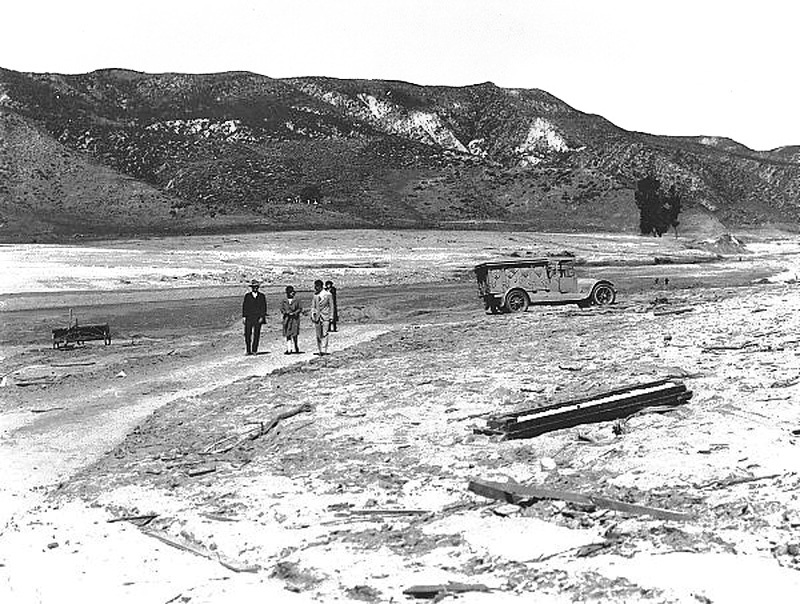 The flood was the second-worst disaster in California history, second only to the San Francisco earthquake and fire of 1906, and left a huge deposit of silt and rubble where ranches and livestock once stood. On the hillside in the distance (looking west), the Ruiz family cemetery can barely be discerned. The dam break claimed the lives of six Ruiz family members, Rosaria and Enrique Ruiz and four of their children, ages eight to thirty, who were buried in the little cemetery. Moore's stagecoach stop, built about 1854 and later known as "Holland's" or "Hollandsville," was located just below the cemetery.